The good folks at Sun Poker are not afraid to put their heads on the chopping block when it comes to offering the best and biggest deals. Amongst the $10,000 freerolls and $1,000 reload bonuses, now comes the Headhunter Challenge! 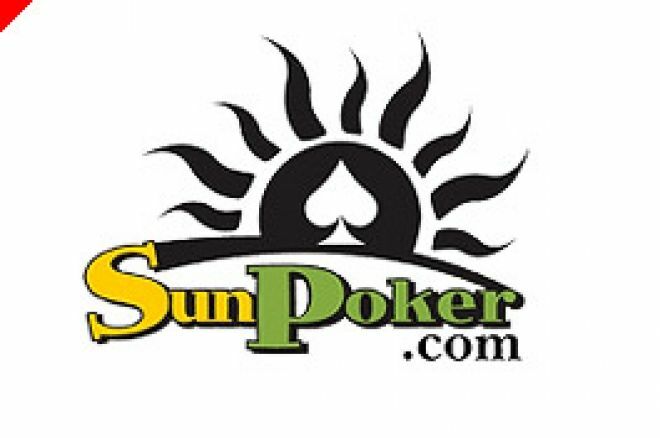 Sun Poker is a leading online card room using the highly respected CryptoLogic software platform. Sun is possibly the most attractive of the sites to new players simply because of the juiciest new player freeroll around today. Every month, Sun Poker puts up a huge $10,000 for all new players to compete for in a totally free-to-enter tournament. This special event is only for new players joining in that one month, so July joiners will have the freeroll all to themselves! Fantastic value there for sure. But that is not all. Every new player at Sun Poker can also join in the excitement of the Headhunter Challenge. This brand new concept in tournament play will have all players, new and old, in a frenzy. It is guaranteed to bring the "nutters" out in force and good players just love playing against reckless opponents. The great thing about it is that a player does not even have to make the final placings to win money and make a profit on his or her buy-in. Instead, the prize pool is allocated 50:50 between (a) the top placings in the usual style, and (b) the Headhunters' bounties. When you enter one of these tournaments, you can be sure the rest of the field have your cards marked already (metaphorically speaking of course!). Each player starts with a bounty value on his or her head. This is worth half of your buy-in. If you are knocked out immediately, that other player wins your value and this surviving player's own bounty goes up in value. The more players you knock out, the more valuable you become to your opponents. You can expect to find the low stacks and the professional "Headhunters" in the field gunning for you and raising you all-in on a regular basis! If you play well, you will realise that these players will be lowering their card standards so you can capitalise by calling them when you have a decent hand yourself. The winner of the tournament will also have a belt full of scalps worth even more money! To add yet more incentive, the player with the highest Headhunter rating at the end of each week advances to the Weekly Champions Tournament. Ed note: Take full advantage of Sun Poker's exclusive $10,000 freeroll for all new players in July and sharpen your weapons for the Headhunter Challenge!